Bailey Pegasus revamped and ready to fly again! This month we bring you a sneak peak of the 2011 Bailey Pegasus II, the second generation of the award-winning Pegasus range, and also brief news of a new entry level Bailey caravan. Both models are to be launched at the 2011 Boat and Caravan in February at the NEC. Alu-Tech body shell, and insulated to Thermal Grade III classification of EN 1645-I verified by rigorous testing methods. 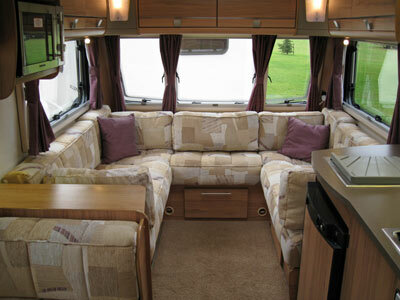 The exciting new Pegasus II range will be available in a choice of five layouts with a choice of two interior soft furnishing schemes including bolster and scatter cushions. Co-ordinating bed linen will be available as an optional purchase, to complete the ultimate look of style, comfort and luxury. Pegasus II Genoa: 2 berth model with a new end washroom configuration. 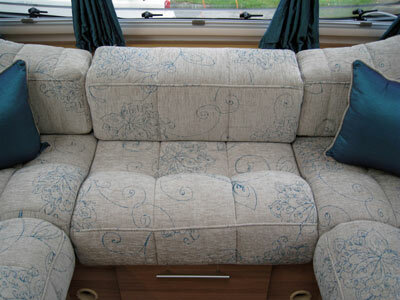 Pegasus II Milan: 4 berth model with a new end washroom configuration. 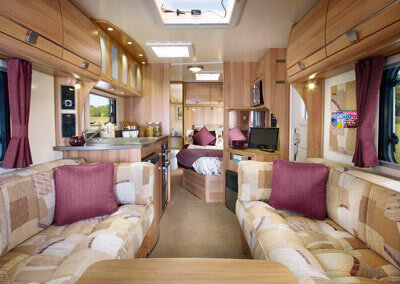 Pegasus II Verona: 4 berth model with fixed nearside bed and end washroom. 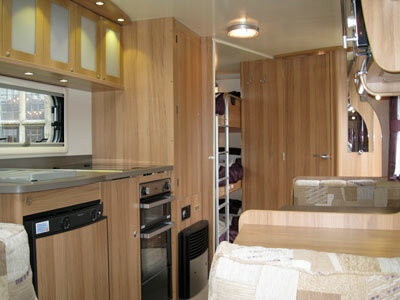 Pegasus II Ancona: 6 berth model new layout end bedroom with rear triple bunks and a corner washroom. Pegasus II Bologna: the only twin axle model in the range, a fixed nearside bed 4 berth model sporting an end washroom and a new kitchen layout featuring a large capacity (117L) Dometic Series 8 refrigerator with electronic ignition and detachable freezer compartment. New 800 watt microwave oven to complement the four burner gas hob, oven and grill. New style “drop down” flaps on front bed boxes. Please note unlike the first generation Pegasus, the new Pegasus model will no longer have an alarm or a Tracker monitor system fitted as standard. However, the Pegasus II’s AL-KO Secure and AL-KO ATC anti snaking system will ensure healthy caravan insurance discounts. Prices are to be confirmed but we are told that if you subtract £1,000 from the current Pegasus 534 price of £17,255.00 (the Pegasus II Verona is the equivalent model) you will have an anticipated price. i.e. £16, 255.00. That includes VAT @ 20% but excludes the delivery charge. The Pegasus II range will be shown to the public for the first time on Tuesday 22nd February on stand 5130 and 5120 in Hall 5 at the Boat and Caravan Show to be held at the National Exhibition Centre (NEC) in Birmingham from 22nd to 27th February. We can also tell you that a new range of interesting entry level Alu-Tech models will also be launched at the show; they could even be described as “revolutionary” so watch this space! Display models of both ranges will be on dealer forecourts following the show. *Caravan insurance cost based on 2011 Bailey Pegasus II Verona valued at an estimated £16,225, fitted with hitchlock, wheelclamp, Al-Ko secure wheel lock and Al-Ko ATC (Al-Ko devices are standard on this model). Kept on drive at HX4 0BE. Caravanners over 30 years old, claim free for 3 years and a member of a caravanning club. Premium includes insurance premium tax at 6% and is correct as of 19.01.11. We bought a pegasus Genoa July this year ,on first trip away we noticed kitchen sink was scratched where the plastic feet of the basin were rubbing, basin supplied by Bailey sink is made of aluminium why not stainless steel,awaiting dealers solution. We bought a new Genoa this year, although we love the van, we have experienced a few problems.with the layout. just to mention one when you try to pull the folding table out it catches on the hinges scratching the table, and having met up on sites with 4 other new owners they all agree, one guy is a woodwork teacher and as altered the fitting. anyone else had probs. With ref to my comment May 1st. My Verona has arrived and although its not going to a site untill the weekend i have slept in it every night since got it last weekend. It ticks all the boxes for livability, superb bed, roomy kitchen, comfy living area, good lighting for reading or soft lighting, bathroom area spacious, excellent storage and good accessibility to the cupboards above the bed. Hopefully when the time for its first service comes along we won’t get nasty damp ingress shocks!!!!! But with the Alu Tech build this shouldn’t be the case. Like you Chris bought the 6 berth off a dealership it was their only one and wanted for display and showing , wife fell in love straight away told them we wanted one they said being produced in may will order you one she said I want one now and this one will do or we walk poor dealer had to sell us his and wait forbade new display model , it was well worth the argument as a 6.4 fella wi a 3 and 5 yr I need space and this van gives it and more storage than my house , this van offers everything the only thing I would want would be a sat rec point , so if thats my only whinge its good. We saw the Pegasus2 Verona in the Caravan magazines around 18th february so went to our local dealer on 20th to see if they had one that we could view as we were looking for a fixed bed model. They had two. One had gone off to the NEC show where it was being launched and we were taken to view the other one which was not yet out on display in the showroom. We fell in love with it that day and bought it. We collected it a week later on the 26th February ( the sales staff said they thought it was the first on the road in the country) and we are delighted with it. We have taken it out twice to date. Work commitments have prevented us going out more than this up to now. We would not have been tempted by the Peg 1 and the “goodies” that came with it at the price. We already had a 16″ Avtex TV, and have found that not having an alarm or tracker has not made a huge difference to our insurance, anyway we could have either of these fitted at a later date if we wanted them. We felt that the much improved interior design and the lower price made the Peg 2 a much more attractive option for us and have not been disappointed with our purchase. 2 years ago i bought the lovely Swift Conqueror and loved it’s luxury interior and smart silver sides. Sadly we are parting ways, it has had two leak problems, one quite serious, a new door, it is now in the dealership again and we are missing out on Easter weekend and this extended weekend in this glorious weather with door lock problems and window rim problems. I have just put a downpayment on the Pegasus2 in the hope that i never have a leaky caravan again!!!! I purchased a brand new 2011 model Pegasus 534 in early January and I am absolutly delighted with it, not to mention I got £2360 of the list price, It may not be the latest model, but that does not matter to me. compared to the new Pegasus 2 it has more to offer, Tracker/ Alarm reduced my insurance costs to £215.00, Omnivent which is a must when its raining when your cooking, 16″ Avtex 230 / 12v multimedia DTV DVD (this is no ordinary TV you buy from any tv retail shop this is a proper bespoke touring tv), lift up bed boxes which also make day bed type chairs, I also got an option of a free mover or slide out awning or chest of draws or bespoke caravan bedding, I chose the bedding it looks the business, the whole deal was fantastic included swapping my mover over and delivering my caravan to my front door. Oh and the build quality is excellent. All in all I am a very happy caravanner. Went to see the Peg2 Milan last weekend. Spent a lot of time looking in that and the Unicorn Madrid. Have to say that I am so so pleased we have the Peg 514. So many things I would miss that I have now. I would consider it a down grade which I am not prepered to do. An upgrade would be the Unicorn but far too old fashioned feel like the Senator which is really really dated now. Love the Peg1. No problems with mine at all. 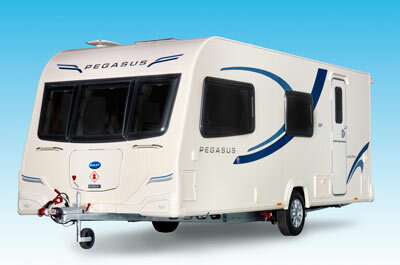 i am a proud owner of a 2011 pegasus 646 !we have just had our first trip away in it and i have to say it was fab !! ive just looked at the new bailey and to be frank i dont think i would like to be sleeping next to the toilet and shower! we much prefere our model as my 3 children have their own bedroom which can be closed off , and as for price we may have paid more but we got alot more for our money ,im sure if you totaled it up seperatly the extras would of come to alot more !! overall very very pleased. I am considering buying a Pegasus 546, I love the idea of the end childrens room. Has anyone else had any serious technical problems with the Pegasus range? With the price being reduced by £2000 would everyone consider this value for money? Baileys concentrate on technical achievements NOT customer service. I bought a Pegasus 546 last year (2010) and there were some serious issues. The dealer wasn’t interested and so contact made to Bailey’s was made, but also fruitless. There are some great caravans out there and if I was buying again it would have to be Elddis NOT Baileys. We owned an Ace Jubilee Viceroy from new – 2004 model. We chose it because we loved the lay-out for our family. It was an entry level caravan although it felt like luxury to us! We’ve had fantastic holidays in it – even to Switzerland and France. We looked at the Bailey Pegasus last year and were initially tempted by the hype on the new body structure – but on actually seeing the vans at the Glasgow show last February, failed to be impressed enough to change our Ace. Since then, Swift have relased their new range in Challenger and Conqueror – we loved the sunroof – and loved it just as much in the flesh as it looked in literature. We’ve now had our Challenger 565 – twin bed model – since last November and absolutely love it! We love the end bathroom with the larger shower cubicle. Both caravans were bought because they suited our needs and wants at the time – if you do that then it won’t matter what comes along next – you’ll love the caravan you have. Shop around – don’t buy in haste – consider what you’re looking for – wait til the right model comes along and you won’t end up disappointed within a matter of months. Happy caravanning! Too much snobbery in this world. 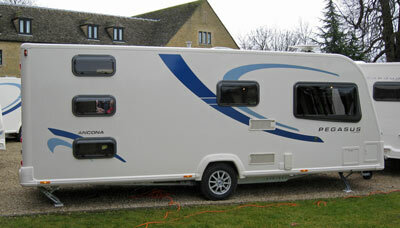 We have been caravanning for 4 years now and have just ordered a Pegasus 2 Genoa at the Scottish show. Delighted is an understatement. The old 1997 Avondale that it is replacing is a great van too. Make the most of what you’ve got. We plan to enjoy the Pegasus for many years and don’t care what comes out in the meantime. Caravanning is all about seeing places and chilling out, not worrying about which newer van is going to take up the next pitch. Just purchased the Bailey Pegasus Verona at the Manchester show as exhibited. My wife noticed that the front chest and table between the front seats was an optional extra in the previous pegasus. This was not shown as an extra at the show. We checked with our dealer, sure enough its an optional extra, so we have had to pay an extra nearly £300 to have one on delivery. Did anyone else notice this as an optional extra. I bought a Pegasus 546 when they were launched last year, and have to say that we are delighted with our van and had a great first year in it with our 2 girls. I am looking forward to getting away in it again this year, and am really not bothered that all these new models have been launched. Enjoy what you have people……..plenty of people cannot afford these new vans and make do with older models, but still enjoy caravanning. My amusement grows: Carole Rowe – are you in some sort of contract that forces you to buy every new model that Bailey release? You didn’t like the blinds in the california – why did you buy it? you didn’t like the way the bed worked in your pegasus – why did you buy it? is this another example of site snobbery……..
Oh here we go again the Pegasus owners complaining that something better has been released – Malcolm Ablett hits the nail on the head ‘sick of trying to keep up’ With who may I ask? or do you really mean ‘of trying to have the latest model on the site’? I have no sympathy with this sort of snobbery – I was so disappointed with Bailey’s offering in the first Pegasus that I held onto my Senator 6 – quite happy with it and not in the least bit bothered that it wasn’t the latest model on the site!! Now a very happy Unicorn owner and even happier that my specific tastes govern what I buy and I don’t get drawn in by the snob factor seen above. Yet again we see those negative comments from Pegasus 1 owners complaining that theirs is no longer the ‘best’ – I fail to understand these people – did you buy your caravan because you liked it or just purely for the snobbery and show off factor that you could say you had the latest? We bought our our Senator 6 new in 2009 and our initial reaction to the Pegasus was unprintable – we told our dealer that if Bailey didn’t up their game we would not be buying another of their caravans! Pleased to say they did and we are now very happy with our Unicorn. The moral of this? Stop the snobbish practise of ‘must have the latest model’ and buy only what you are happy with – Otherwise belt up and suffer the consequences! This model needs to be a huge improvement. My current stone chipped Pegasus looks like its been shot by a twelve bore. Add to that poor quality interior finish with screws falling out,blinds falling to bits etc. I am trying to sell it but I suppose its worth even less now the prices have dropped. A couple of dealers I have been to do not even want to take the Pegasus in part exchange for a new van. I can honestly say my six year old Swift was in better condition when I sold it than my year old Pegasus is now. I’m in the same boat as Frank above – just purchased a 2011 model Pegasus 524 and haven’t even taken delivery yet. I do prefer the interior colorways on the Series 2 model, but our layout has been dropped from the new range so we wouldn’t have been able to but one anyway! Maybe this will hold up it’s part-ex value in years to come!! I total agree with every thing that has been said about Bailey’s caravans, I have ended up over the last 2 and half years buying three new caravans because the way Baileys have brought out their new ones,I had the california but in the end did not like the blinds by the television,then I bought the Pegasus with the bed that pulled out that was a nightmare to do,I have now which I am very pleased with the twin axle Barcelona but more expensive we had to change our brand new car to pull it, we are now poor but now enjoy the caravan we are not going to change,no money left. I totally agree with Lynne. I bought a pegasus534 in July Last Year, a brand new top of the range model, then all of a sudden the Unicorn becomes top of the range only months later.Now a new pegasus II. Sick of trying to keep up, this will be my last caravan. Whole heartedly agree with Janet Simpson. Is the caravan industry trying to kill itself off? Bring back a basic caravan for people who want to use them as ‘getaways’. My 2.0 diesel Mondeo Estate isn’t ‘officially’ heavy enough for most of the 4 berths now !! It is all very well building caravans with all mod cons but this puts the weight up. Car manufacturers are cutting down weight of vehicles to increase economy and decrease carbon emissions. We are at the point with our tow vehicle that the new 2 berth caravan exceeds the 85% guidelines given by both the Caravan Club and the Camping & Caravan Club. We will have to stick with the Bailey 4 berth we have now. We cannot afford to upgrade as we would have to change our tow vehicle which we cannot do. We bought the ‘new’ Pegasus 534 in March 2010, we were delighted, until not long after the Unicorn was introduced and now the Pegasus ll, not so happy now. Lots of our friends are in the same frame of mind. What’s with all the secrecy? if we had known about the Unicorn we would have waited and bought that and if people that bought the Pegasus this year knew about the Pegasus ll so would they, thanks Bailey really good policy that, upset your regular customers and loose them money. Yes I’m really pleased having just bought a so called ‘2011’ model pegasus 546! Thats just lost about 4 grand already! Hi, we are excited about the new pegasus series 2, we have a Olympus 534 and are now thinking of swapping for the new twin axle Bologne, Good to see they have dropped the tracker/alarm, tv isnt big enough but love the caravan build! 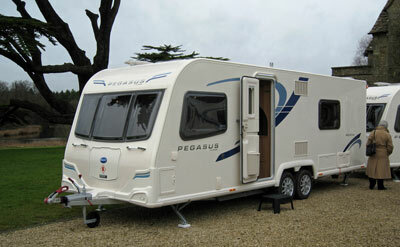 Hi there, I have looked at you pictures of the new bailey pegasus, I purchased the 2010 version a few months ago. I am pleased to see the cookers in the new pegasus are not the same as the one i have. in my pegasus the oven and hob are seperate. above the oven is counter space which gets very hot when the oven or grill is in use. I thought u should know this as it can be dangerous. I would like to see a comprehensive caravan & car breakdown service available with your offer of caravan insurance. Thank you for your feedback. We are currently investigating launching a travel and breakdown product that is suitable for caravanners which we hope to launch later in the year.